STANDISH—Emily Bartash – just a sophomore – led the Scots to victory when Falmouth came to town on Friday evening, Feb. 1. Bartash kicked in 22 total, including seven in an overwhelming first quarter, eight minutes in which Bonny Eagle built a 27-6 advantage. The Yachtsmen did make up a bit of ground as the game wore on, but ultimately slipped again to succumb 61-40. Bonny Eagler Taylor Johnson opened the first quarter with a two; fellow Scot Emma Abbott then nailed a pair from the line and Bartash dropped in her initial bucket for a quick 6-0. The Yachtsmen got on the board next, but Bartash followed up their lone strike with three frees and a two. Sam Averill actually tallied the Scots’ heftiest take in the first, earning eight, two of which she scored on a Avianna Rath feed and two more of which she scored on a Abbott steal-feed combo. Mackenzie Emery also added points during the stretch. Falmouth outpaced their hosts in the second quarter, chewing through six points of their 21-point deficit. Cameron Birks, Chelsea Graiver, Maddy Joyce, Brooke Douglas and Olivia Rogers each drained a two during that time, and Karley Piers drained a three. 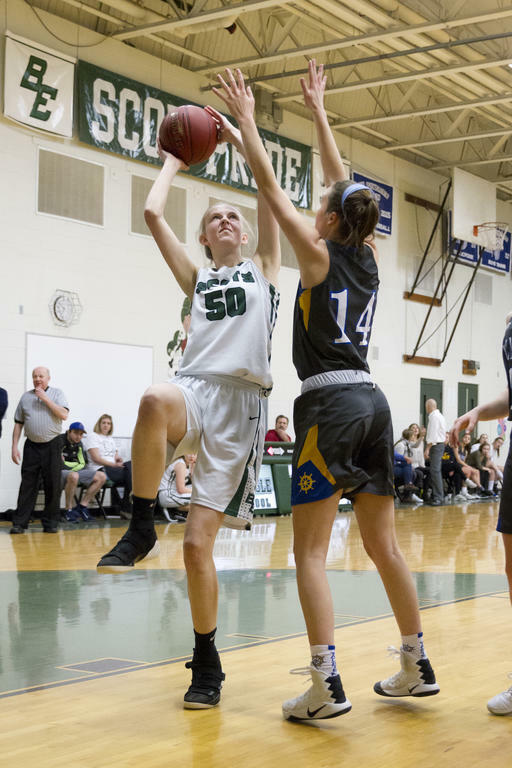 Bonny Eagle was hardly silent – Emery hashed a couple frees and Meghan Champagne one, while Bartash hashed another two and Allie Hegarty a two as well. The Scots rushed back out front in the third, however. 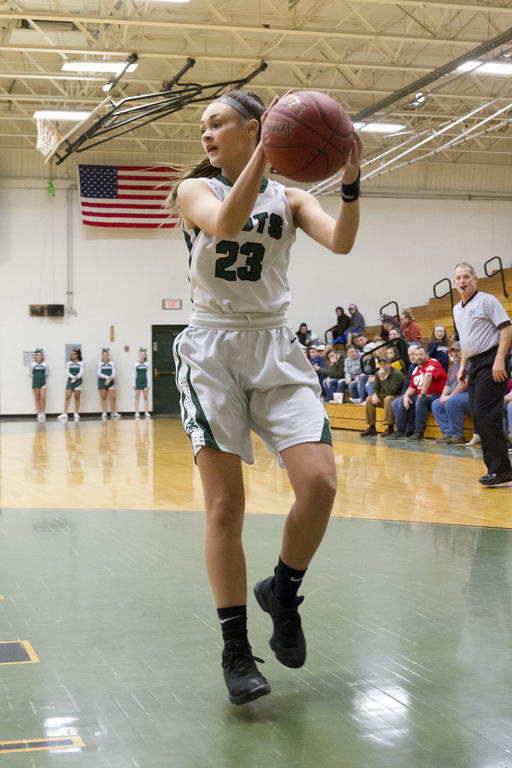 Bartash picked up two more twos and two more frees, Averill a three and a two and Emery a two as the home team outstripped Falmouth 13-7 and recovered their 21-point upper-hand. 47-26. In the fourth, the sides matched up evenly, grabbing 14 apiece. Johnson had a three for the Scots and Champagne a two; Hegarty also had a two, and Bartash two twos and three frees, en route to Bonny Eagle’s eventual victory. The Scots moved on the win to 10-6 this winter. The team, currently ranked fifth in AA South, welcomed Massabesic (No. 7, 6-10) on Tuesday the fifth; they close their regular schedule two days later at Windham (No. 2 in AA North, 10-6). Avianna Rath reels in a rebound for the Scots. Taylor Johnson skirts a Yachtsmen opponent. Sam Averill fires off an inside shot. Emma Abbott battles past a Falmouth enemy. Emily Bartash led the Scots to victory, tallying 22. Mackenzie Emery helms the Scots’ offense from her post at point guard.